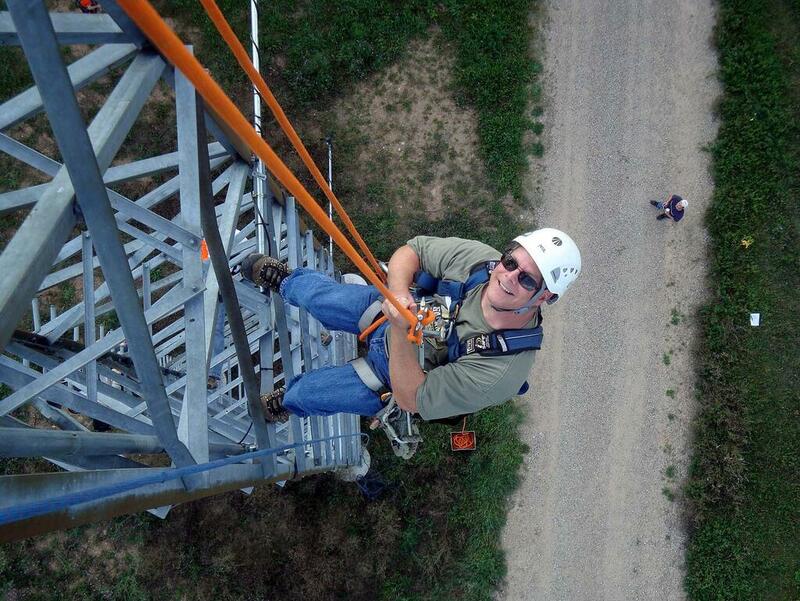 Many companies that hire tower climbers have their own training and certification processes. There is, however, an alternative. Some one may take the classes with an external company to give them an edge for a career with the company they want. Even if someone has been a tower climber for many year, retaking a class can give a sort of refresher or update to keep him or her ahead of the game. Aside from the technical and electrical aspects of tower climbing, courses similar to the ones listed below focus just on the climbing, safety, and foreman aspects. Tower Climbing Safety – It may be called something different from location to location, but this course should include a classroom lecture and hands on training. The hands on training in the class room is designed to get students comfortable with; the rigging apparatus, ropes, harnesses, lanyard, and connections. After the lecture portion, student will have the opportunity to utilize their skills on a tower. This is where they learn how to climb and maneuver. The practice tower is usually 50-150 feet. This also give students the opportunity to come to grasp with the heights and for businesses to evaluate their new hires. Climber safety and rescue- The class of this equivalent should meet or exceed OSHA standards. This is where a student will learn the specifics of working on wind turbines, water tanks, wireless and broadcast towers. Topics covered in a course such as this are ANSI standards, PPE, NATE Climber Training Standards, fall protection and rescue. This course is generally taught over several days.Even upon completion of this type of course, it is still recommended that the student be teamed up with an experienced climber who is used to varied conditions. Certification – This will vary a bit depending on the company and if it is a general course or one taught by a specific employer. In general, students will learn what their roles and responsibilities as climbers are, company policy (which varies from company to company), different types of knots, varying rope types and qualities, maintaining equipment, descending, a safety plan (for different situations), OSHA standards, self-rescue and coworker rescue. If it hasn’t already been covered, this is where trainees will learn how to identify potentially dangerous, usually unseen hazards, such as burning in legs as a symbol of EF radiation. All those unexpected situations, like sudden storms and dangling wires, will be covered to ensure the safety all personnel. The following courses may or may not be required depending on employer, state laws, pay grade and position, but can be beneficial to anyone in a tower climbing related job. Advanced Climber and Rescuer- Recommended for supervisors, crew leader and oversees or anyone who wants to apply for one of these positions. It will cover topics taught in the basic climber courses, but more in depth. This type of course should comply with OSHA, NATE, and ANSI training standards. For those who want to keep their feet on the ground most companies offer courses in Safety and Rescue designed for non-climbers – Specifically laid out to teach ground workers, managers, CSR, engineers, and safety inspectors what safe climbing practices are. Though they may not be up on a tower, it is everyone’s responsibility to watch out for the safety of everyone on the crew. Roles and responsibilities relating to their specific position will be covered. Theses student will also learn some of the items of importance climbers learned, such as, knots, equipment, tower hazards, site hazards, inspection, care, controlled descent, maintenance and rescue (self and co-worker). It is common practice to have those in the non-climber courses oversee those in the climbing courses. There is usually some sort of assessment given afterwards where they pick out the proper gear and act as crew chief. These are just some of the courses that may be taught, but these are the foundation, the groundwork for anyone wanting a career in any of the fields that relate to tower climbing. It has been said before, but it is worth reiteration, safety is everyone’s responsibility, not just those who climb but those on the ground as well. Everyone must be a team looking out for the best interests of everyone.